The Granary Square, constructed in 2015, is an open-air space in the borough of Camden, home to dozens of restaurants, bars, shops and decorative fountains. EHP were contracted to construct a branded gantry to act as the entrance to the square, as a part of its grand opening. 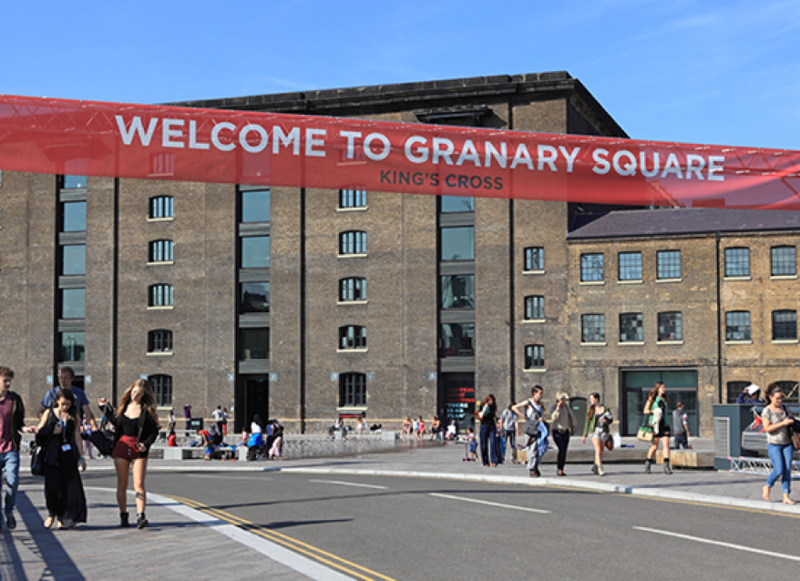 To erect a branded, entrance gantry for the opening of Granary Square. The gantry should be high enough for London buses to drive underneath, and wide enough to straddle the entire road. The main challenge facing us on this particular project was ensuring the width and height of the gantry met expectations and requirements. The base of the gantry was built using Milos M290v truss, whilst Milos MPT self-rising blocks and Milons M390L ensured stability in the structure’s legs, as well as the unusually expansive width. Due to our meticulous planning and design, the whole setup of the gantry took just 30 minutes, and proved an effective and impressive entrance for the newly opened square.